Credit to damndelicious.com for this creative and tasty recipe. Season chicken breasts with salt and pepper, to taste. Add to skillet and cook, flipping once, until cooked through, about 3-4 minutes per side. Let cool before dicing into bite-size pieces. In a medium bowl, combine chicken, Greek yogurt, red onion, celery, mayonnaise, almonds and lemon juice; season with salt and pepper, to taste. 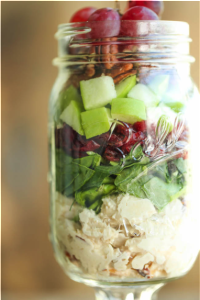 To assemble, divide chicken mixture, kale, cranberries, apples, pecans and grapes into four wide-mouth canning jars with tight-fitting lids.